The number of passengers using the main airport in the Outer Hebrides soared to a new monthly record in October, according to figures released by airline Loganair. 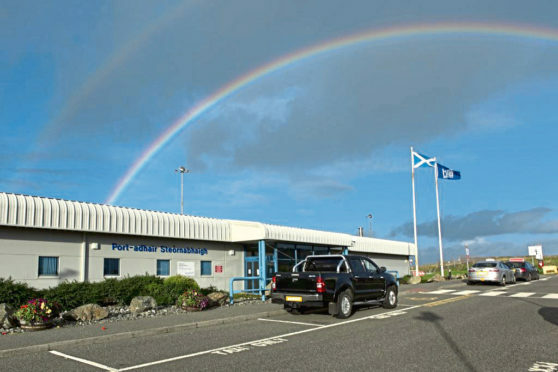 Boosted by trips to the Royal National Mod in Dunoon and school holiday journeys, the statistics showed a 22% increase in people travelling to and from the Stornoway terminal compared with the same month last year. A total of 11,093 people flew on Loganair services from Lewis to Edinburgh, Glasgow and Inverness and Benbecula in October. The company said the Glasgow flights saw particularly strong volumes, carrying almost 7,000 passengers. Loganair managing director Jonathan Hinkles, said: “October was a very busy month for Stornoway, seeing a surge in passenger volumes on Loganair services to and from the Isle of Lewis. “The Glasgow route continues to perform well, responsible for over half of the overall traffic, but equally, Edinburgh and Inverness are also seeing strong figures. Eastern Airways last month announced it was ending its service between Stornoway and Aberdeen, saying the route was no longer viable. Loganair also released figures showing it was the UK’s most punctual large airline on domestic routes in August, with 84% of flights taking off withing 15 minutes of scheduled time, compared to an industry average of 74%.